With Halloween practically upon us, spooky stories, scary movies, and haunted houses have made their fervent appearance as well. It seems like everyone loves a good scare, and I count myself among those numbers – eagerly seeking out new suspense films to watch and mysteries to read all October long. And yet, with all of this talk of ghouls, goblins, and evil spirits, I can’t help but notice an odd trend among people in general, and it forces me to ask the question – Why are people so much more willing to believe in negative spirits, or the idea of “evil” in general, than they are willing to believe in the idea of angels or miracles? Bear with me – I realize that this can be kind of a controversial topic because the words “angel” and “miracle” are so closely tied to the ideas of religion in our society today – but religion isn’t quite what I’m talking about here. And I don’t believe our fear of religious controversy should keep us from the discussion or belief in positive spirits or “good” (“good” being an equal to/opposite of “evil”), especially when it doesn’t prevent people from talking about or believing in “evil” or negative spirits – so I just ask that you help keep this conversation open and respectful with the understanding that everyone has their own set of beliefs! Anyways, the idea of everything having an equal or opposite force opposing it is nothing new to us as people, and it’s a theory that scientists and mathematicians work with a lot. And yet, when something bad happens in our lives, we’re much more likely to think a negative force was behind it, than we are to think a positive force was behind something good that happened to us. Which doesn’t really make sense to me because we experience all sorts of “miracles” every day – each time we get behind the wheel of our car and don’t get in an accident, each time we enjoy a family vacation at an amusement or water-park and nobody gets injured, we are experiencing the benefit of grace – the miracle of having something bad not happen to us when it just as easily could have. I, myself, have experienced several near-misses that can’t be explained by anything except, sheer luck. At least, that’s what I’ve attributed it to at the time. And yet, I’m starting to wonder if I shouldn’t be thinking that there’s a little more to it than that. After all, if I’m eager to stay in a “haunted” house, that must mean that I believe something’s out there in the spiritual world that’s negative…so why shouldn’t I also believe that there are some good spirits out there, too?? Not just that, but in our day-to-day lives we encounter and hear stories about all different kinds of people. Some are amazingly good, and go above and beyond the call of duty to ensure others’ safety, or better their lives. On the flip side, some are – well, maybe I won’t call them bad people – but some are people who do bad things, resulting in harm or injury to many – and we are quick to believe these types of negative energies exist in a similar way in the spiritual world. So why is it so hard for those same folks who believe in the negative, to believe in a sense of “goodness” on an energetic or spiritual plane? I’m sure a lot of this is a generalization and I know there are many people who believe that there is no spiritual/energetic influence on our lives at all, and many who believe that everything that occurs to us is orchestrated by a higher presence. This is just an observation that I couldn’t help remarking upon, and I also felt like it was a good reminder, or little ear-worm to think about. So next time you’re having a horrible day and feel like everything’s out to get you and weigh you down, remember that – like a see-saw – there’s an equal force of good on your side, that’s there, lifting up the rest of your life as well! What do you think? Do you see people as believing more in the idea of evil than in good? 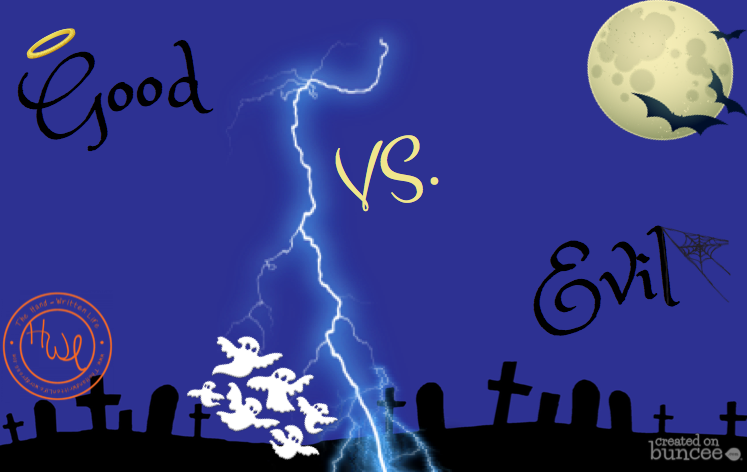 Or do you see people believing more in the idea of good than in evil? Which do you see as the more powerful force? Are you more likely to feel like the universe is picking on you on a bad day, or fulfilling your wishes on a good day? 31 New Movies for The Month of October! Yes! It’s amazing how much your life can change when you have that shift in perspective, too. The world, and your place in it, are so much more positive when you focus on those good forces hard at work by your side!